As a TV Producer, I travel a lot with work. Over the course of the last 14 years or so making telly shows for the likes of the BBC and Channel 4, I’ve been lucky enough to visit all sorts of random places – many in the UK but some as far afield as Australia, Namibia, Iceland, the USA, India, South Africa, Italy and Norway. 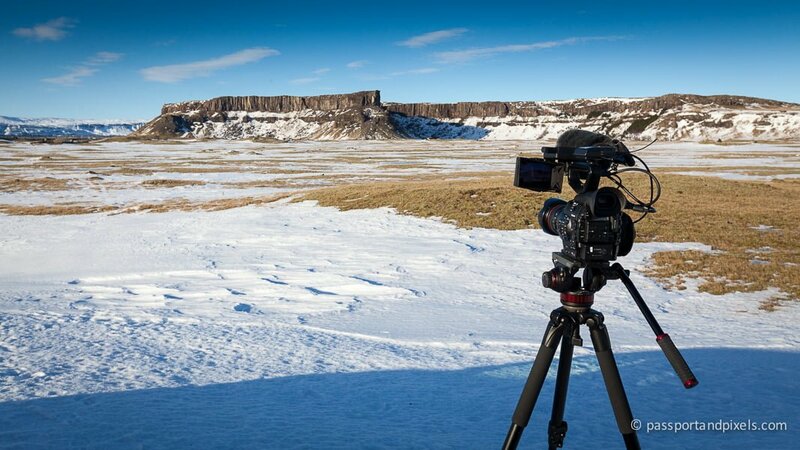 Of course, filming abroad is far from being a holiday. Sure, you get to go to some cool places, but often you’re there for just a few hours, charging around like a headless chicken, trying to organise everything you need to film, and always with nowhere near enough time to get everything done, let alone stop and look around. More often than not, all I really see on these trips is the airport, the inside of the hire car, the hotel, and one or two filming locations. Which of course, clearly makes me a complete expert on the places I’ve visited. And that’s why I’ve decided to write these ‘Unhelpful Guides’. Accompanied by the few random photos I had time to snap, and one or two facts I picked up along the way, I’ll tell you absolutely nothing of any use to the would-be traveller about the place in question. In fact these guides will be specifically designed to be not the least bit helpful when it comes to planning your own trip. If you want useful information, I suggest you go buy the Lonely Planet instead. But hopefully these posts might be a bit entertaining, and give you some insights into the kick-bollock-scramble life of an on-the-road TV producer. 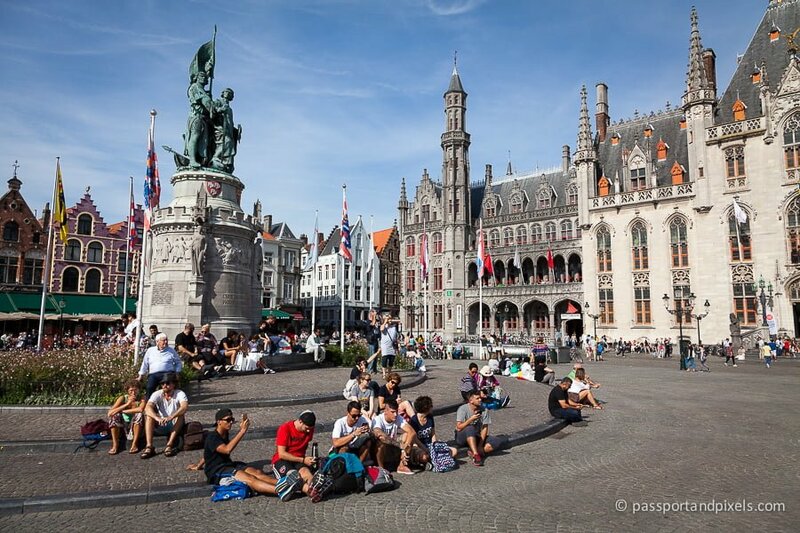 The main square in Bruges. At least I think it is. There might be another one. 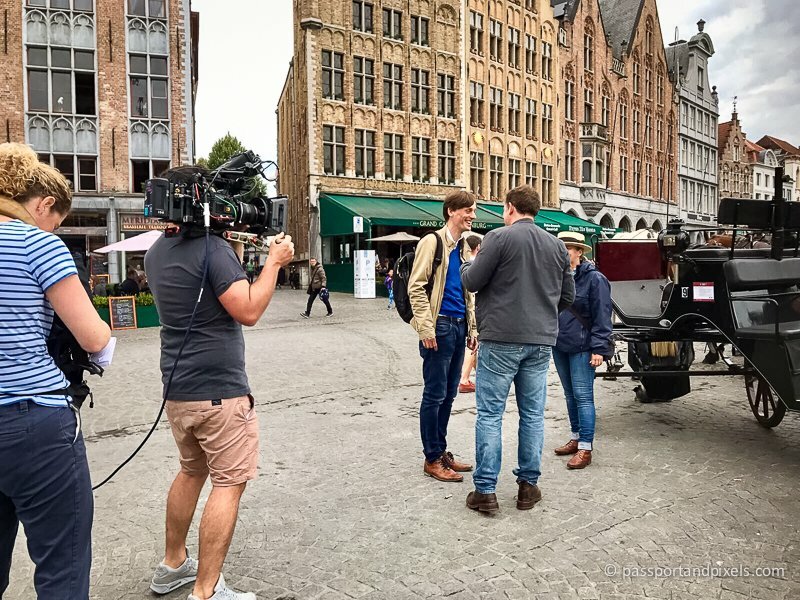 I went to Bruges to film a scene for a popular Channel 4 food science series with a team consisting of Ollie the cameraman, Rich the sound guy, and Matt the presenter. I’m pretty sure you can get to Bruges on the Eurostar, but we went by plane, flying to Brussels from Heathrow Terminal 2 at about 11 am on a Monday morning. Because we always have shedloads of equipment we have to allow masses of time for check-in, but assuming that goes smoothly, I often treat myself to a nice breakfast while we wait… at least, as nice as you can get in an airport. I actually don’t hold out much hope for airport breakfasts since I had the most underwhelming plate of total crap at the Wondertree cafe at Luton on the way to filming in Rome. I mean, Luton Airport is the seventh circle of hell anyway, but you’d have thought they could manage something as simple as poached eggs and avocado on toast. But no, the eggs were cold and solid in the middle, the avocado was rock hard, and the toast was soggy. Not a good start to a tough week away. Heathrow Terminal 2 has a Wondertree too – which I swiftly vetoed. The other options were The Perfectionists’ Cafe and The Gorgeous Kitchen. Both clearly attempting to sound inviting but in all probability massively overselling themselves. Disappointment is bound to follow as sure as (rubbery) eggs is eggs. 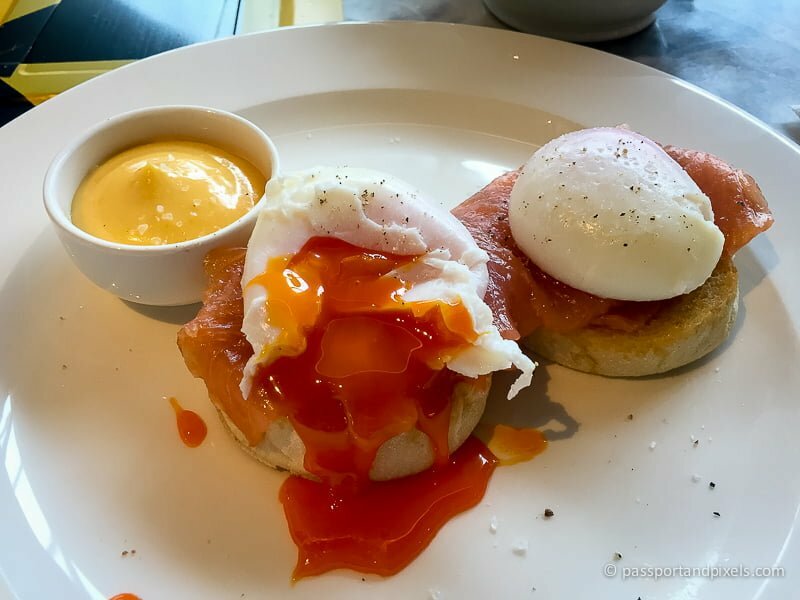 But since choice was limited, we arbitrarily went for the Perfectionists’ Cafe (because it was closer) and I ordered my usual favourite breakfast of Eggs Royale with the hollandaise on the side (yes I am Sally from When Harry Met Sally). And given my extremely limited expectations, imagine my delight when this pair of beauties landed in front of me. Check out the colour of that yolk (hashtag nofilter)! On arrival in Brussels we picked up our hire car and drove the hour or so to Bruges. On the way we stopped at a supermarket outside the town of Ghent to pick up lunch, water, and snacks. So it turns out the first two photos I took on this trip were both of my food – and the first photo I took in Belgium was of a supermarket car park. You don’t get this wondrous level of detail with Lonely Planet, that’s for sure. Lunch may have been in a car park (yes, TV is glamorous), but it was actually pretty good. 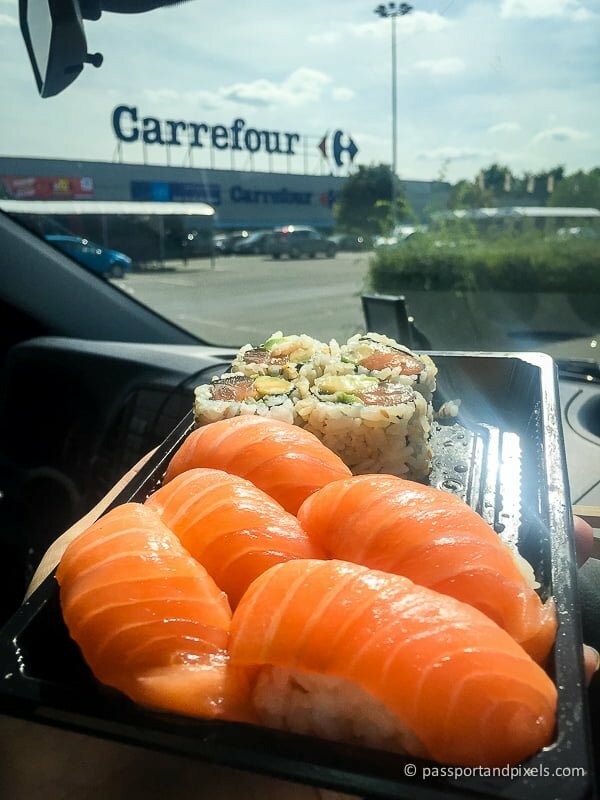 Did you know Carrefour supermarkets have a fresh sushi counter? No, nor did I. There you go, one actual useful fact for you. You’re welcome. We arrived in Bruges late afternoon, dumped our stuff in the hotel (Martin’s Brugge, in case it’s of interest), and immediately dashed out to film some general shots of the city centre before we lost the daylight. Our hotel was close to the main square, so we wandered that way to get shots of some of the impressive architecture. At least, I think this is the main square. It looks pretty main to me because it’s huge and surrounded by impressive buildings and was full of tourists. I have no idea what any of these buildings are – I could google them but I can’t be bothered and I’m sure if you’re going to Bruges your guidebook (or Wikipedia) will be far more helpful. This is the central bell tower. I know this because it has bells that play a little tune every half hour. The first time you hear them they’re rather charming, but if you’re trying to work they very swiftly become extremely irritating. I could hear them from my hotel room when I was trying to write emails and make phonecalls, and when we were filming an interview in the square they started up halfway through and we had to wait for them to finish before we could carry on. Not helpful. I’m sure they’re very cute and lovely if you’re on a romantic mini-break, but they definitely weren’t my favourite thing about Bruges. It was a nice afternoon – warm and sunny. But one thing I did learn about Bruges is that the weather is extremely changeable. Although we had sunshine the first afternoon, the next day it poured with rain. So here’s my top travel tip for Bruges: bring an umbrella. 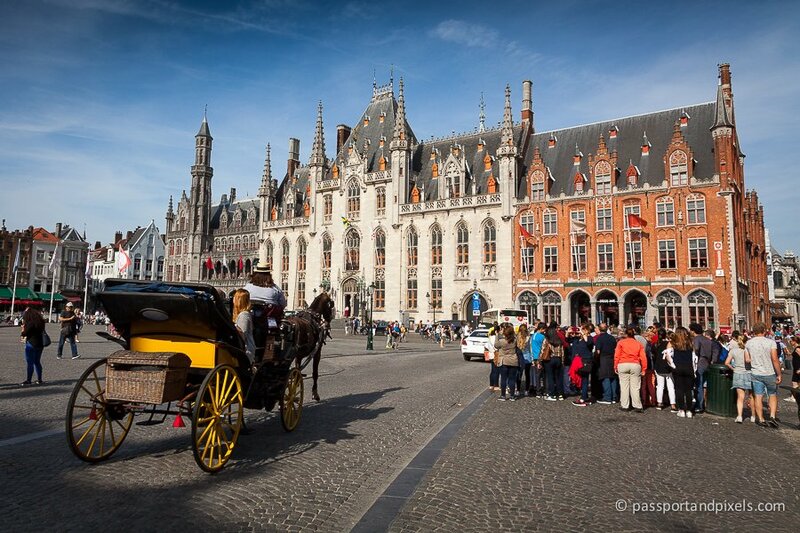 Bruges is famous for being cute and pretty, with cobbled streets and gorgeous old architecture. And I’m happy to report that unlike plenty of places that don’t live up to the hype, Bruges definitely does. It looks exactly as it does in the guidebook photos. So we actually managed to spend an enjoyable (and not too rushed) couple of hours getting some pretty shots of Bruges in the can. In case it has escaped your notice, Bruges is in Belgium. 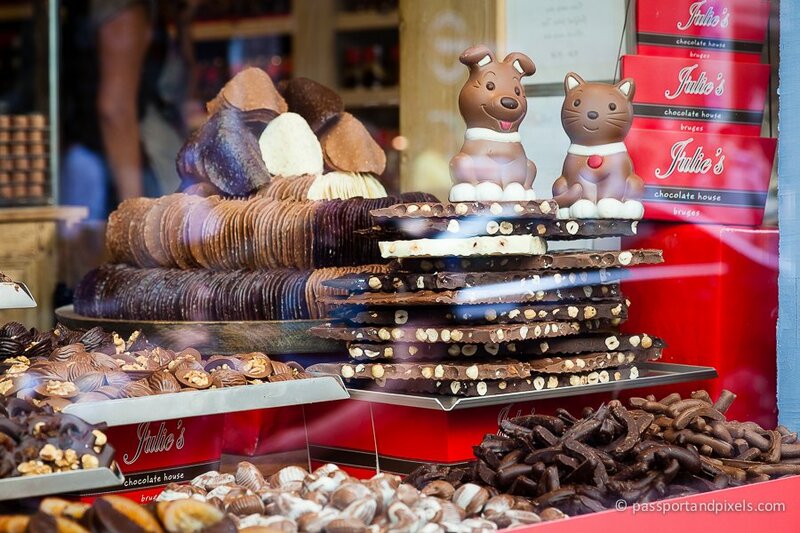 And as any good sugar addict will tell you, Belgium is famous for chocolate. I don’t actually know why this is – it’s not like they grow cocoa here. If you want to find out, ask the internet. I don’t have time right now, I’ve got a blog post to finish. So anyway, Bruges is teeming with chocolate shops. There’s about ten on every street. I’m not sure why there needs to be so many, or who in their right mind would think ‘Hey, there’s only nine chocolate shops on this street, maybe I’ll open another one’… but clearly plenty of people did because they are everywhere. I didn’t actually go inside any of the chocolate shops – we just stood outside and filmed through the window. This one is called Julie’s. I have no idea if it’s any good but it certainly smelled pretty tempting. Though I’m sure if you want to buy chocolate in Bruges there are others that would do just as well. 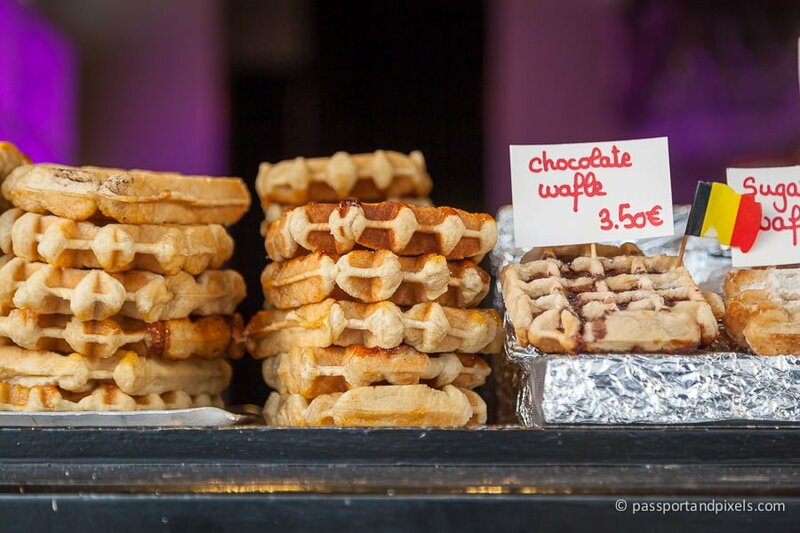 Belgium is also famous for waffles. Again, no idea why. I think they might have been invented here, before they were adopted by the Americans who now destroy them (and their arteries) by dousing them liberally in syrup and squirty cream. I didn’t have a waffle in Bruges either, but you might want to. Since you’ll be on holiday ‘n’all. 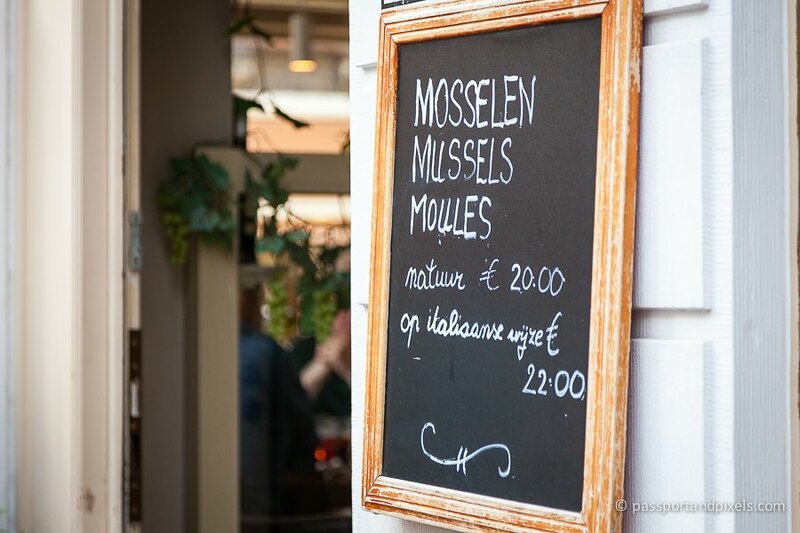 The last thing you might want to eat in Bruges is mussels, which is basically the national dish. From a quick wander round it seemed like most restaurants were serving them so you won’t have trouble finding some, if seafood floats your boat. Belgium doesn’t have all that much coastline, so it’s not immediately obvious why moules-frites (mussels and chips) is their thing, but apparently they’re pretty good. I wouldn’t know, since I didn’t try – though I think I should have done. 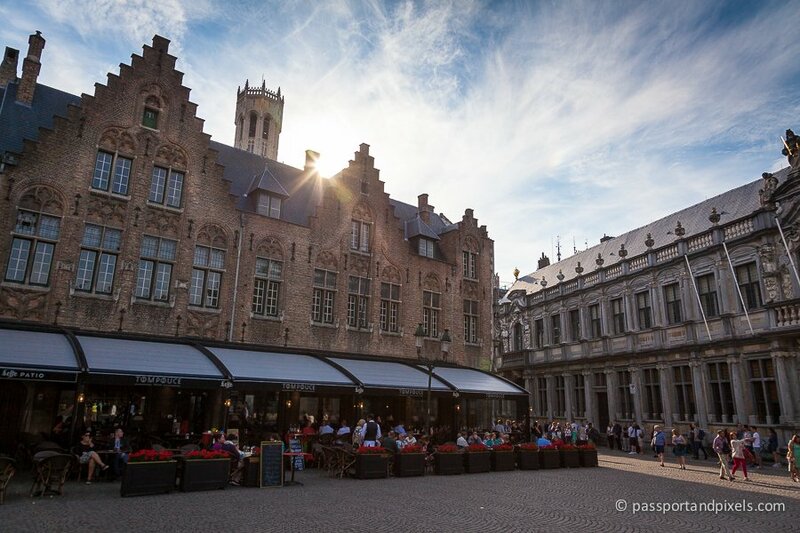 For my one dinner in Bruges I had another speciality – a Flemish beef stew – which turned out to be a bit too rich and heavy for a sunny summer evening. 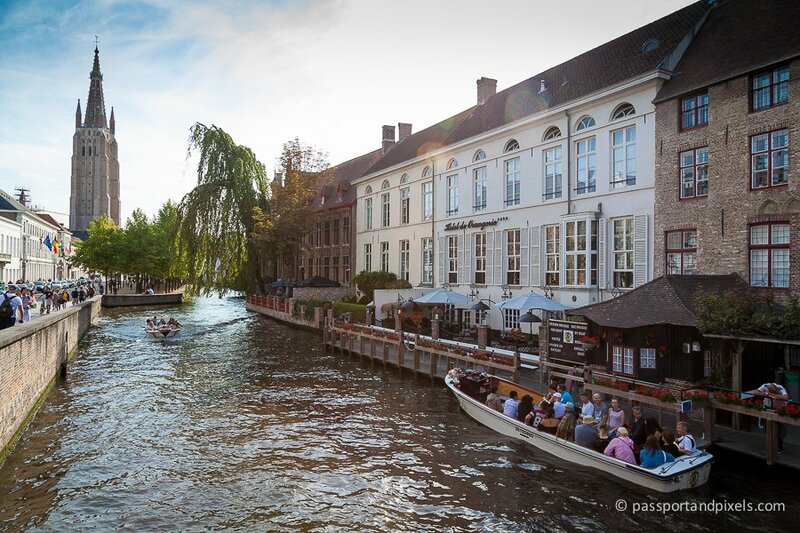 Bruges is famous for its canals. In fact they call it the Venice of the North (I haven’t been to Venice so I can’t comment on the similarities but it was certainly very pretty). There were boats full of tourists going up and down so clearly that’s a thing you can do – if you have time, which we didn’t. Also putting the cameraman into a boat would have necessitated a lengthy addendum to my risk assessment and I couldn’t be bothered with that. So we just filmed the canal from a bridge instead. 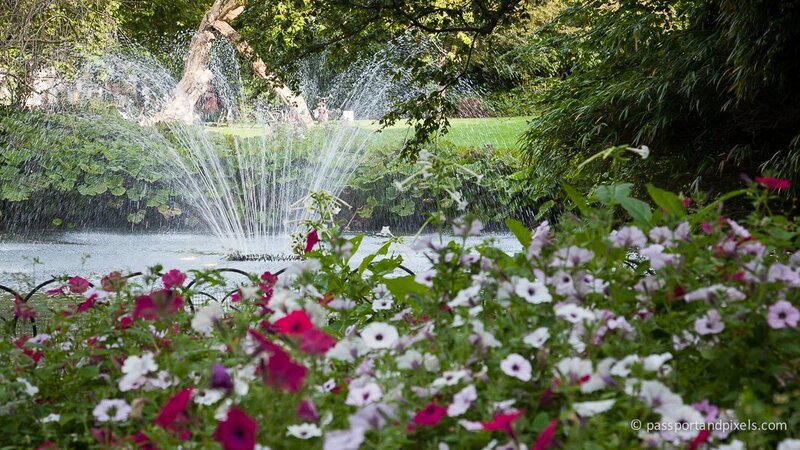 There’s a couple of nice parks you can visit. One is called Minnewaterpark, which apparently is pretty and has an iconic lake with a castle overlooking it. We were supposed to go and do some filming there but it was a bit far away and as usual we didn’t have enough time. Instead we went and took a look at the much-closer Koningin Astridpark (Queen Astrid’s Park), where I took a single photograph. Yeah, I know it doesn’t tell you much, but the park is peaceful and a little off the beaten track – while still being very close to the main square. It’d be a good place to have a picnic if it doesn’t rain. Unfortunately for us it did, so we didn’t film there in the end. 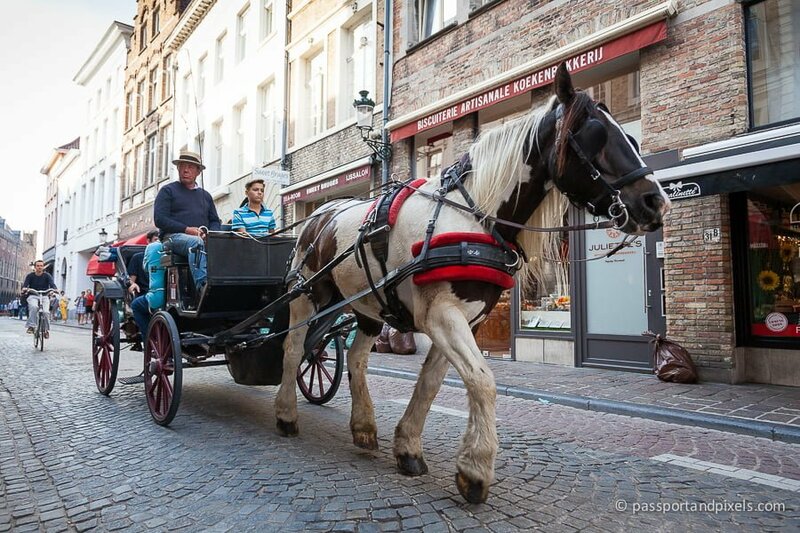 The best way to see the whole of Bruges is by horse and carriage. The tours leave from the main square and cost (I think) EUR 50 per half hour which is pretty expensive, but unlike me you’ll no doubt be there on a romantic break, so why not treat your other half? You can pre-book in advance or just turn up on the day and wait in the queue. The company is called Hippo, which (for the language fans amongst you) is the Greek word for horse. Another useful fact there, at no extra charge. You can thank me later. This is actually the one thing we did get to do. 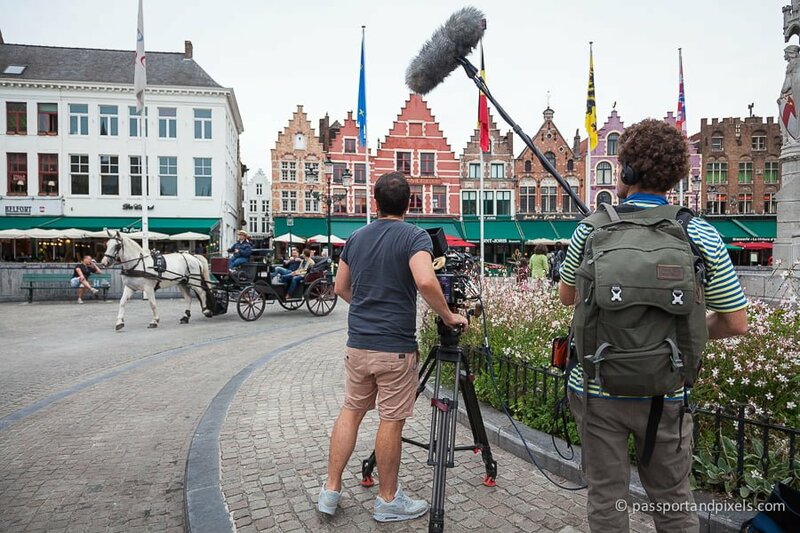 The trip was booked in advance for the next morning and the plan was to meet the driver at 11 am and spend an hour driving round Bruges while we filmed an interview in the back of the carriage. As a TV producer one of the things I spend my life doing is repeatedly checking the weather forecast on various platforms. On this occasion most sources agreed that it was going to start raining at by 11 am and rain for the rest of the day. So we had to panic-rearrange the trip to start at 9.30, to make sure we’d finished the interview before the heavens opened. Our driver was called Valerie, and we were also accompanied by one of the company bosses, Mathias, who was very helpful and took this photo above and the one below, which is why I’m in them. That’s me in the stripy t-shirt. 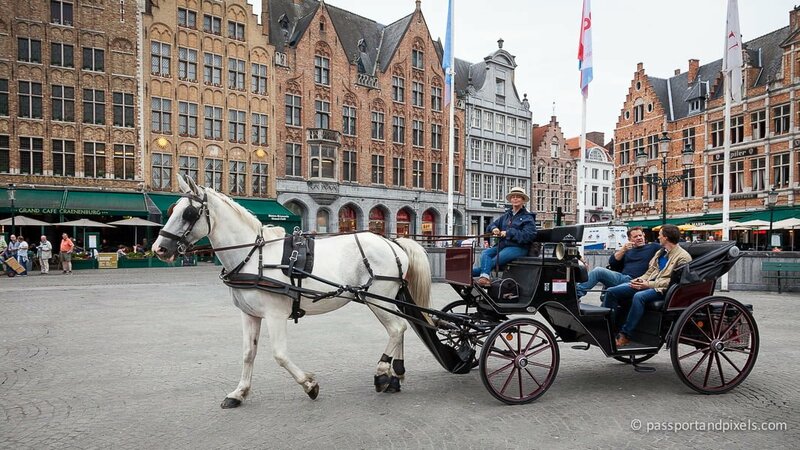 Normally, the horse and carriage trips will take you all round the city, but we didn’t need to do that for the purposes of the interview. 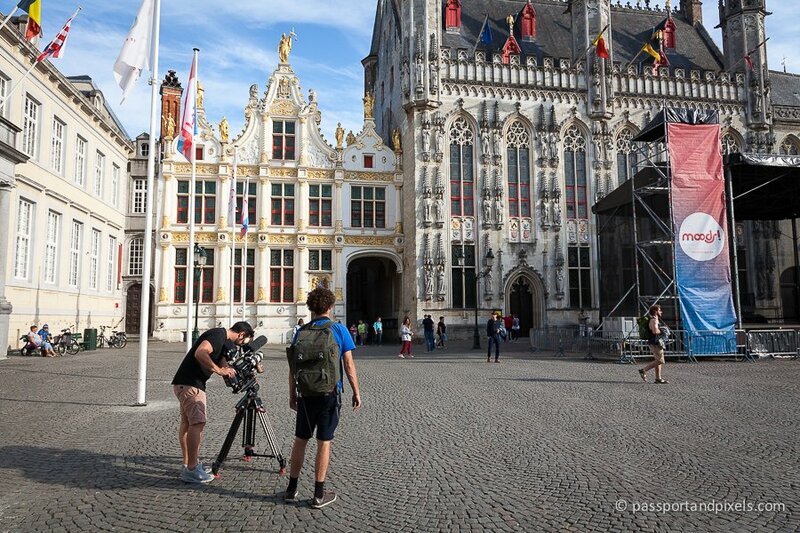 So we just did loops of the main square and the surrounding streets, to keep the filming contained and make sure we could get all the shots we needed. The next thing we were due to film was a scene with two people having a picnic in one of the parks we’d checked out the day before. But with the forecast saying it was due to start raining by 11 am, I needed to come up with a new plan. After all, a picnic scene is going to look pretty shite if it’s chucking it down. The quickest and easiest solution was to make the scene an indoor meal instead. So at about 9.30 pm the previous evening I had marched into a nearby restaurant, looking like nothing more than a regular tourist, introduced myself as a TV producer from London, and begged the staff to take pity on our poor, weather-threatened production. By sheer luck the owner was there, and despite the fact that I had no proof of ID on me, and could have been just about anyone, he not only believed my story but agreed to let us take over part of his restaurant for two hours over lunchtime the next day – at no charge. What an absolute hero. 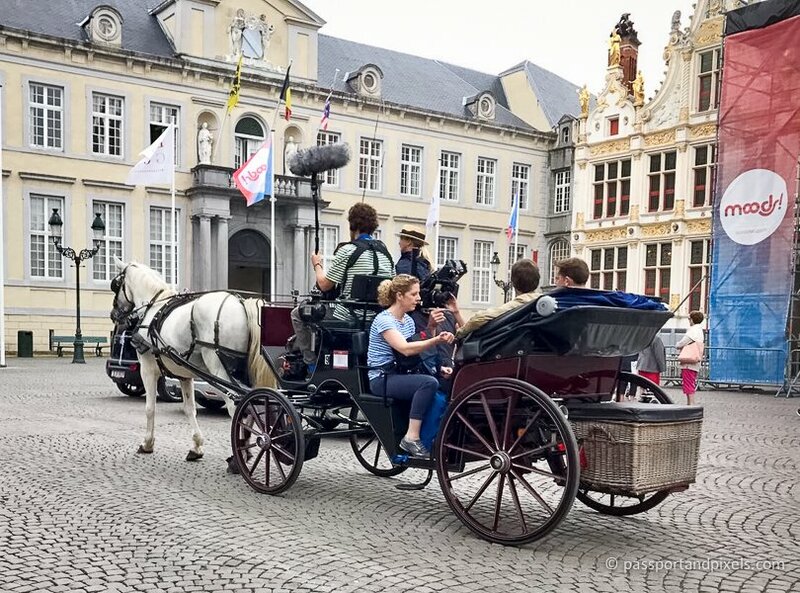 This enormous kindness meant that after finishing our horse and carriage tour, we were able to head straight for the restaurant and film our second scene. Which was just as well, since no sooner had we set up than the heavens opened, and it pelted down for about two hours. Our picnic would have been a washout. So please raise your glasses to Alex, owner of the restaurant Maria Van Bourgondie in Bruges, who pretty much saved my life. I can’t comment on the food, but the staff were absolutely wonderful, so if you happen to be in the area I recommend you pay them a visit. 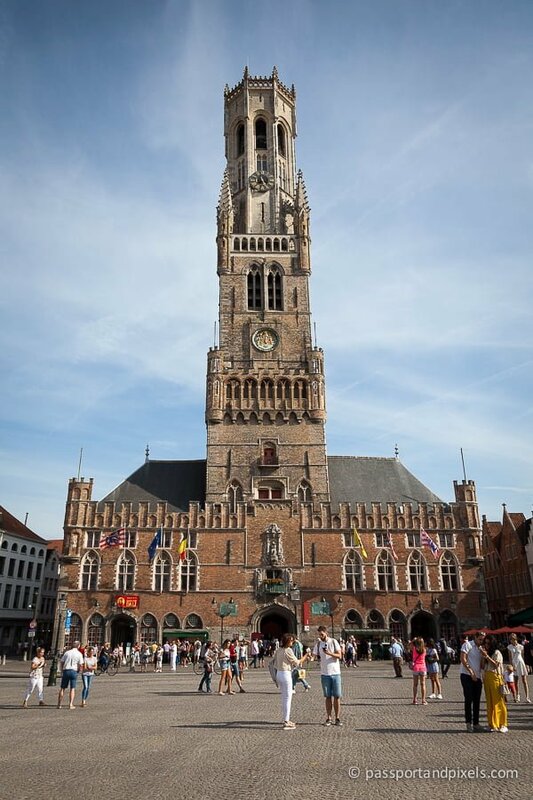 We left immediately afterwards – meaning the total amount of time I spent in Bruges was about twenty hours. One thing I will say though – I did like the place, and would definitely like to go back for a proper visit one day. 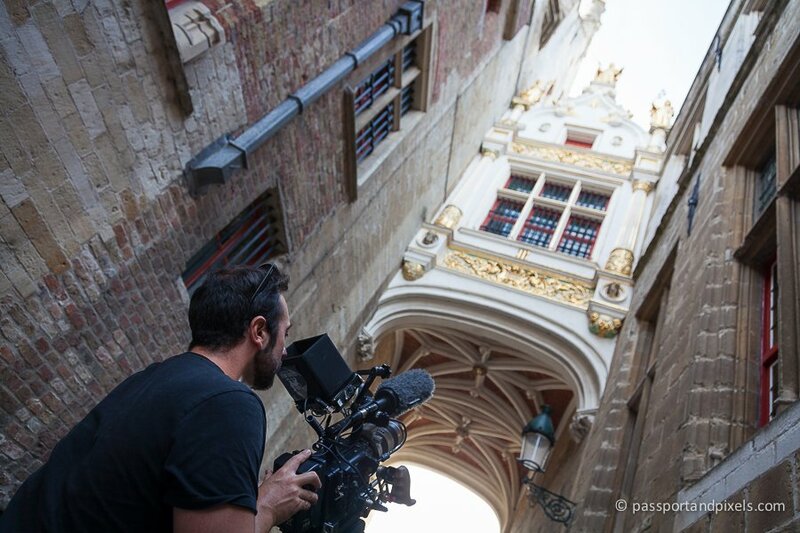 From Bruges we travelled on to Warsaw for more filming. If you’d like to find out more about that, visit my Unhelpful Guide to Poland. Though if you’re planning to visit there any time soon and want some advice, don’t bother. It definitely won’t help with that. I laughed the whole way through this post! 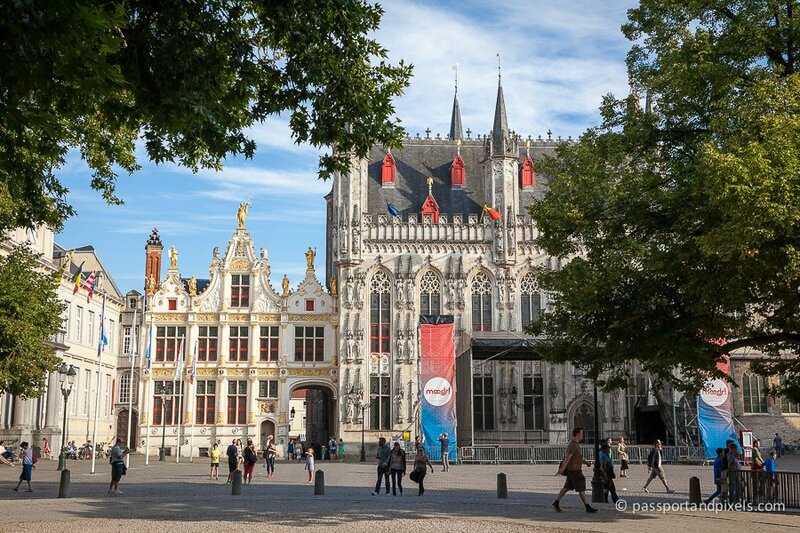 Although it was intended to be pretty unhelpful, it totally was helpful, maybe I should take one for the team, go there and find out why chocolate is a big deal in Bruges. If you liked this one there are a couple of other Unhelpful Guides published, and hopefully more coming in due course. I stayed at the same hotel and loved Bruges, my waistline didn’t though, but hey, it was Christmas time, and chocolate over indulgence is expected! I don’t think you can go to Belgium and not eat chocolate! It’s basically the LAW! Thank you so much! I suppose I did pick up one or two things along the way, but certainly not enough to really help anyone planning a proper trip. But if you found it entertaining that’s the main thing, and thank you for taking the time to comment! 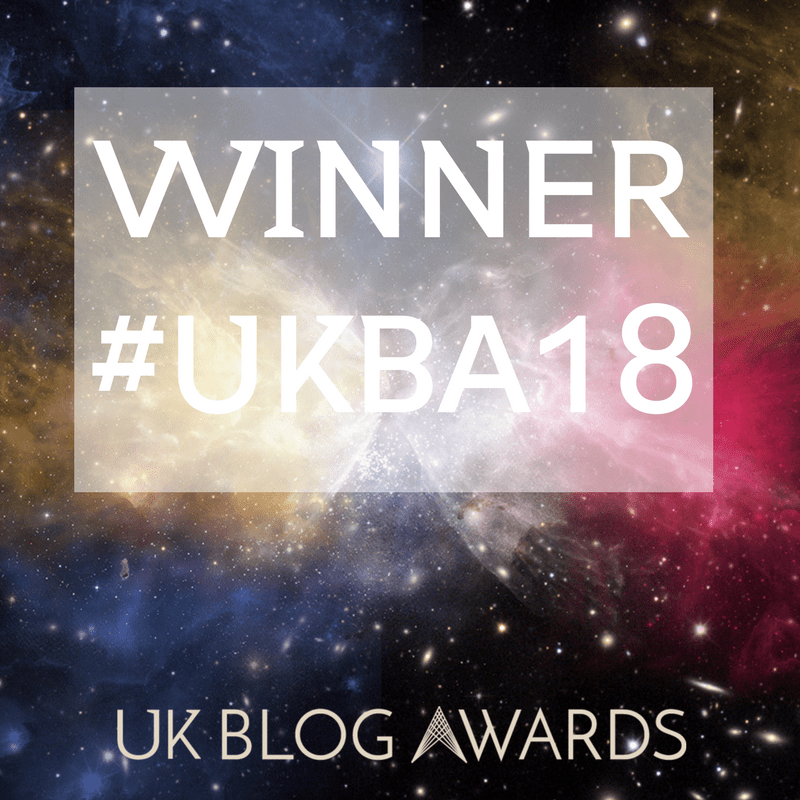 OMG loving your blog. So many great posts. This unhelpful guide series cracks me up! That’s really so kind of you to say. You’re totally inspiring me to write more! Just need to find the time!